The Hypercom Optimum M2100 offers a complete POS processing experience, with wireless capabilities that remove restrictions. The GSM/GPRS and Bluetooth communication devices allow mobile payments, making the transaction experience a faster, more enjoyable one. 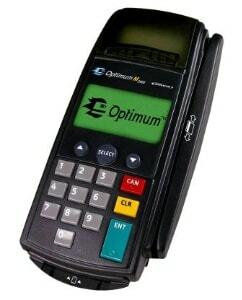 Equipped with a 32-bit RISC processor, this payment device is fast and secure. It comes with a heavy duty battery that can handle up to 300 transactions on every charge, making it the efficient and reliable choice. Easy to use and flexible, the M2100 is ideal for all sorts of markets, including hospitality, transportation and other mobile merchants. A water-splash resistant keypad is paired with an LED backlight to create an easy-to-use interface. It supports multiple languages and currencies, making it an adaptable solution. The M2100 accepts all kinds of payments, including EMV, and it has a generous 12MB memory space that accommodates multiple applications. Topped with a jam-free printer, this device is practical and manageable. The Hypercom Optimum M2100 is cost-effective thanks to its advanced wireless capabilities. Its graphic screen allows for targeted marketing through display logos for advertising, or messages during the transaction process, making it more personalized for customers. At Firemane, we sell new and used POS equipment such as used credit card terminals. For new and used Hypercom Optimum M2100 devices, contact us.